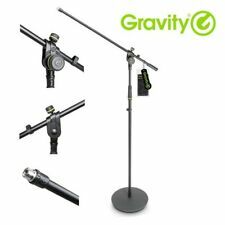 Gravity MS 2321 B Black Steel Adjustable Microphone Stand with Boom Arm. It provides full 360 degree rotation. Professional studio boom arm. Sound & vision. 2-axis swivel mount for accurate positioning. Authorised dealers - full technical support. Online since 1997. 9am-6pm, Mon-Sat. (1)NW-35 Scissor Arm Stand. The adjustable scissor arm stand is made out of all steel construction, sturdy and durable. Folding type, convenient to carry. Can be mounted on the announcers' table. The double-braced arms add strength. SUPERLUX HM-58B Microphone Stand. Riser included. 2 x fixing brackets. 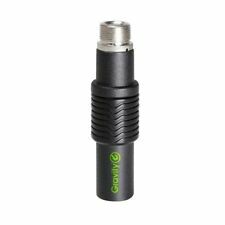 Gravity MS QC 1 B Quick Coupler for Microphone Stands & Boom Arms. The MS QC 1 B is a coupler for rapid and effortless mic clip and boom arm mounting. Thread microphone 3/8". dual thread adapter. Thread stand 5/8". Product type Stands and Tripod Accessories. Universal compatibility. In Ear Monitoring. Max.weight load: 30kg. Length: Approx. DJ Headphones. Accessories for Trussing. Can I reserve item(s) that I intend to buy later?. What is the warranty period on Electromarket products?. The iPhone 4 Music Stand Holder can be mounted on a musician's stand. It is easily fitted and securely tightens in place. This Stand Holder is ideal for DJs or Musicians and will safely support your iPhone 4. Desk Microphone Stand With Boom Arm. A high quality table microphone stand with a boom arm. MORE INFORMATION. For the PL2T, SB-2 and HB-1. The optional DT-1 Flush Mount allows the PL2T to be permanently mounted to a desk or table top. The brass insert accepts a 1/2" Stem. Small desktop microphone stand. With rubber feet. All goods have a 1 year warranty manufacturers warranty (unless otherwise stated) with the exception of goods which are classed as “Consumables”. Stand & Cases. 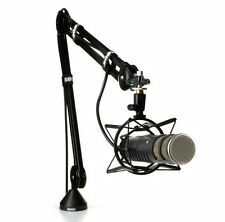 Includes standard microphone clip mount (Microphone & Shock mount are not included). Allows you to adjust the suitable angle and height to show your perfect voice. All goods have a 1 year warranty manufacturers warranty (unless otherwise stated) with the exception of goods which are classed as “Consumables”. Key Points. DJ Live Sound. Live Sound Accessories. Live Sound & PA. Active PA Speakers. Need more information?. What if I have not received my order?. Can I reserve item(s) that I intend to buy later?. Low Level Microphone Stand with Boom Arm A professional short floor microphone stand with boom arm that is adjustable for height, angle and extension. The product features tripod style foldaway legs and has a remarkable stability when in use. Boom extensions of 760 mm. Made of robust construction and with high quality materials, the Series 100 microphone stands offer reliability and flexibility of use thanks to the height adjustment and the double adjustment on the arm. They are suitable for live or studio use. IN THE BOX. 3/8" Adapter. Adjustable -Two ‘T-style’ locking nuts (like pictured on the left) with hard wearing resin knobs, 1 for locking the base, and one for the angle of the boom. 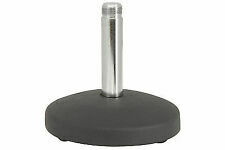 Should a short stand be needed, for instance for mic’ing a bass drum or small guitar amplifier, the boom can be removed, and the microphone clip screwed directly to the stem, for a microphone height of approx 75cm / 2’6”. The boom stand can be attached to any flat desk that is up to 50mm thick, it will securely lock onto the desk and will not move around due to its lightweight and compact construction. Supplied with a microphone clip holder and table/desk clamp stand. New Jersey Sound Black Microphone Boom Arm Stand inc. tablet housing A professional black Microphone boom arm stand to house a tablet that is adjustable for height and extension. The product features tripod style foldaway legs and has a remarkable stability when in use. With boom arm to house a microphone. 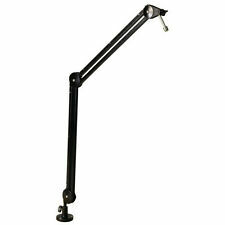 A light-weight and stable microphone stand with a boom arm and folded legs. •Professional Microphone Stand with Boom Arm. • Arm Length: 640mm. •Lightweight at just 1.8kg. • Material: steel and PA.
A professional floor microphone stand with boom arm that is adjustable for height, angle and extension. The product features tripod style foldaway legs and has a remarkable stability when in use. Boom extension of 760 mm. Microphone clip supplied. During that process you will be issued with an RMA number. Country of Origin: China. MIC SCISSOR ARM STAND ONLY ! Microphone & Wind Screen Pop Filter NOT INCLUDED ! The Stand is NOT Suitable for Blue Yeti USB Microphone. 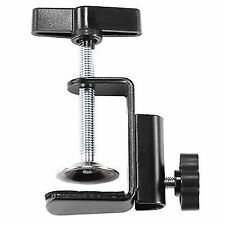 (1) Microphone Scissor Arm Stand (BLACK) (1) Table Mounting Clamp (BLACK). Microphone Stand with Tripod Legs and Boom Arm A professional floor microphone stand with boom arm that is adjustable for height, angle and extension. The product features tripod style foldaway legs and has a remarkable stability when in use. Boom extension of 760 mm. 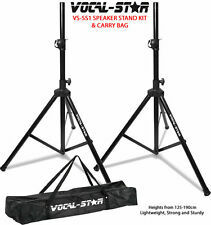 Microphone Stand with Tripod Legs and Boom Arm A metal professional standard floor microphone stand with boom arm that is adjustable for height, angle and extension. The product features tripod style foldaway legs and has a remarkable stability when in use. Boom extensions of 760 mm. CHORD Lightweight cardioid neckband microphone NEW. Filter Gel. Adjustable angle and securely fixed for comfort and safety. Colour Black. The iPhone 4 Music Stand Holder can be mounted on a musician's stand. External Length / Height: 800mm. Supplied with 3/8" locking ring & 3/8" female to 5/8" male thread adaptor. Stand connection: 3/8" female thread. Microphone clip connection: 3/8" male thread. Thumb wheel slide adjuster. An adjustable boom and ergonomic height grip which are quick and easy to use. Boom length: 800mm. The stand weighs over 2kg and has a sturdy tripod base to enhance balance. The tripod base folds for easy storage. Microphone Stand with Tripod Legs and Boom Arm. Fitted with a Tripod base for balanced weight distribution. Height Adjustable Steel Microphone Stand. Straight Height Adjustable Microphone Stand. This Microphone stand is perfect for Musicians, Singers & Bands. The product features tripod style foldaway legs and has a remarkable stability when in use. Boom extensions of 760 mm. 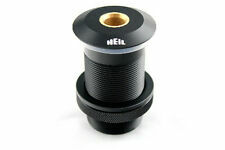 Steel Threaded Adaptor For Microphone Stands geoff456singingblue(3360). Steel Vent Panel (Rack Size 2U). DJ Live Sound. Live Sound & PA. Live Sound Accessories. Need more information?. Can I reserve item(s) that I intend to buy later?. How do I find the item number or product code?. When will I receive confirmation of my order?. 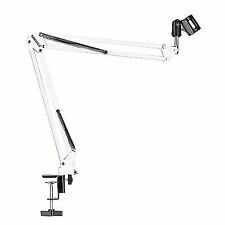 Large Studio Swivel Microphone Boom Arm With Desk Clamp Stand. STUDIO SWIVEL MICROPHONE BOOM ARM. Featuring spring retraction for quick and smooth positioning and a lockable hinge for safety. Microphone clip supplied. Microphone desk stand with boom arm. Desk Stand with Boom. 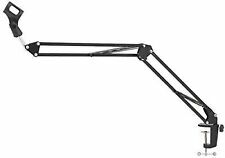 Boom arm: 340 x 14mm. Height (excluding boom): 600mm max. Full detailed specifications are available from the manufacturer's brochures or their websites. Key Points. DJ Live Sound. Live Sound Accessories. Live Sound & PA. Power Supplies. Need more information?. Can I reserve item(s) that I intend to buy later?. How do I find the item number or product code?. Microphone desk stand with boom arm. Boom arm length: 340mm. Supplied with 3/8" to 5/8" thread adaptor. During that process you will be issued with an RMA number. Live Sound & PA. Need more information?. Can I reserve item(s) that I intend to buy later?. How do I find the item number or product code?. What if I have not received my order?. When will I receive confirmation of my order?. Max load: Approx 1KG(If the mic weight exceed max load, the stand will end up falling). Your microphone is held safely and firmly on this scissor arm microphone clip. YOU CAN NOT MISS IT! The Scissor Arm Stand is equipped with super-strong spring so that it can stand much more weight. Microphone with Boom Arm and Microphone Holder. Black microphone stand with boom arm. Boom arm Length 770mm. Vocal- Star MS-1. Microphone holder Included. STUDIO SWIVEL MICROPHONE BOOM ARM. Featuring spring retraction for quick and smooth positioning and a lockable hinge for safety. Microphone clip supplied. Rotates 360°. Features spring retraction and a lockable hinge. In Ear Monitoring. Tube: 35mm. weight load: 30kg. Max.weight load: 30kg. Length: Approx. Accessories for Trussing. Can I reserve item(s) that I intend to buy later?. DJ Headphones.